SEOUL (Reuters) - Samsung Group's founding family on Friday scored a narrow win in a landmark proxy battle, fending off an activist investor opposed to an $8 billion deal that cements its grip as a new generation prepares to take the reins of South Korea's biggest conglomerate. At an often-heated shareholder meeting, investors in builder Samsung C&T Corp approved an all-share takeover offer from sister firm Cheil Industries Inc, Samsung's de facto holding company - but only just. With the backing of two-thirds of votes cast needed for success, some 69.53 percent of shares voted supported the tie-up. U.S. hedge fund Elliott Associates, with a 7.1 percent Samsung C&T stake, had led the charge against the deal, saying it undervalued the target. That view was shared by an impassioned group of domestic retail investors, who saw a merger that bolsters the Lee family's control of Samsung Electronics Co as riding roughshod over minority interests. "While the deal will boost Samsung's restructuring, Samsung lost the faith of a lot of foreign and minority shareholders," said Kang Dong-oh, a proxy representative for an online forum of minority shareholders against the merger. Each of the two firms has stakes in key Samsung companies, including flagship tech giant Samsung Electronics. With 73-year-old group patriarch Lee Kun-hee hospitalized following a heart attack last year, the C&T-Cheil merger consolidates holdings into one entity firmly under the control of 47-year-old heir-apparent Jay Y. Lee and his two sisters. Investors and analysts predict the Lees may now attempt to further consolidate control of Samsung Electronics by having it acquire IT services firm Samsung SDS Co Ltd, or even by splitting Samsung Electronics into an operating company and a holding company through which they can exert control. Samsung has promised post-deal measures including higher dividends and a governance committee. "We will listen to those who opposed the deal and pledge to better engage with our shareholders and be more open to their input and feedback," C&T and Cheil said in a joint statement. Shares in both C&T and Cheil fell sharply after the vote, dropping 10.4 percent and 7.7 percent respectively, as those among investors who had been hoping bid terms might be sweetened exited the stocks. Even though it fell short on Friday, Elliott's campaign is expected to compel other family conglomerates, or 'chaebols', which dominate the Korean economy, to be more mindful of minority investors. South Korean stocks often trade at discounts to global peers due to opaque shareholding structures and low dividends. "The chaebols won't be able to simply have their way anymore. They have probably all realized now how scary shareholders and the market can be," said Park Jung-hoon, fund manager at HDC Asset Management. During the spat Elliott filed for two injunctions to stop the vote taking place. With a stake of more than 2 percent in the merged entity, deal-watchers expect it to continue challenging Samsung with lawsuits. "Elliott is disappointed that the takeover appears to have been approved against the wishes of so many independent shareholders and reserves all options at its disposal," the fund said in a statement. Turnout for the vote was high, with 83.57 percent of eligible votes cast. Roughly 1,000 people crowded a conference hall and three overflow rooms reserved for the meeting in southern Seoul. 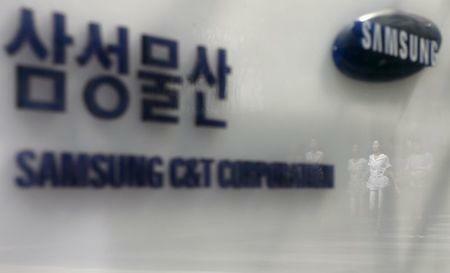 C&T's biggest shareholder, South Korea's National Pension Service (NPS), cast its 11.2 percent voting stake in favor of the deal, said a person with direct knowledge of the matter, providing decisive support for Samsung. The NPS made its decision without consulting an external committee that it sometimes calls upon for difficult votes - and which often votes against company management. The committee on Friday made a rare statement saying it was regrettable that it was not consulted. The pension fund declined to comment.